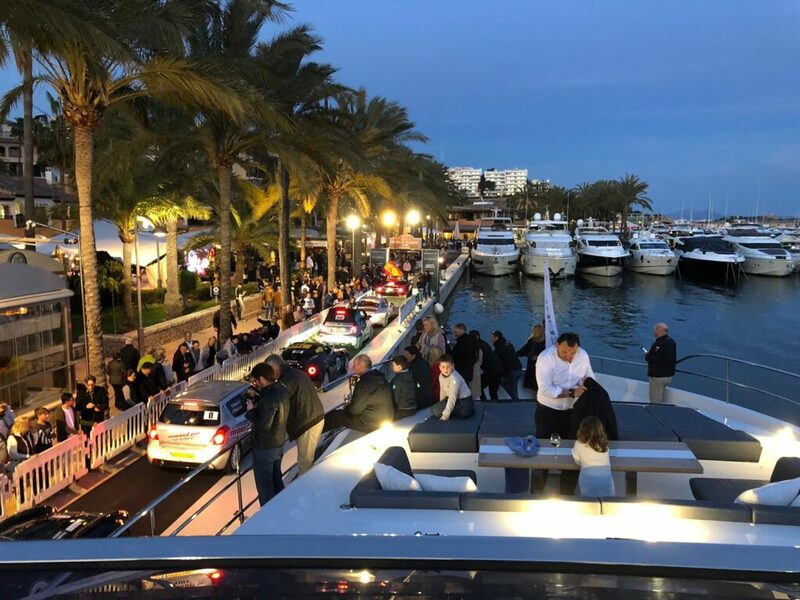 Puerto Portals hosted the 15th edition of The Rally Clásico Isla Mallorca, which is nicknamed “The Pearl of Rallys” and for the celebration of this big event we invited a few special guests for drinks to watch together the start of the race on the evening of 7th of March. 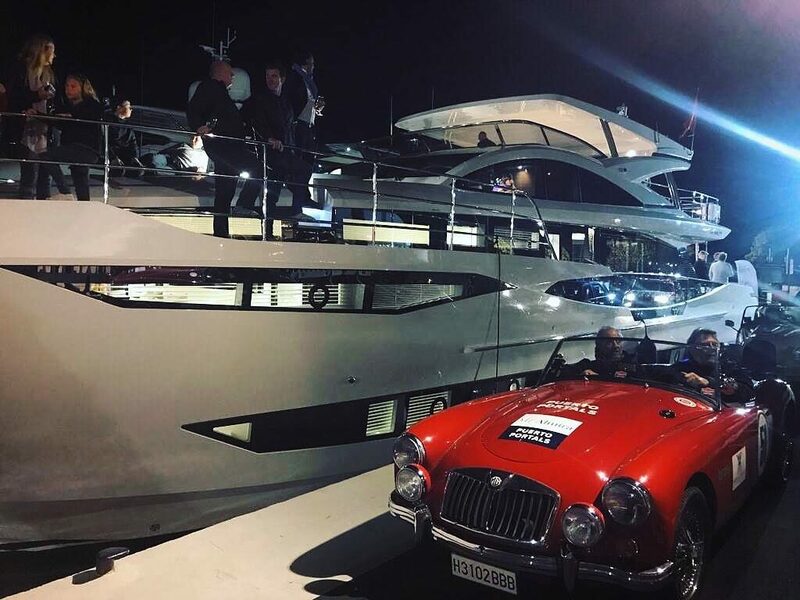 100 classical cars had taken off right in front of our new superyacht , the Pearl 95, which is right at the corner mooring next to the restaurant Baiben. 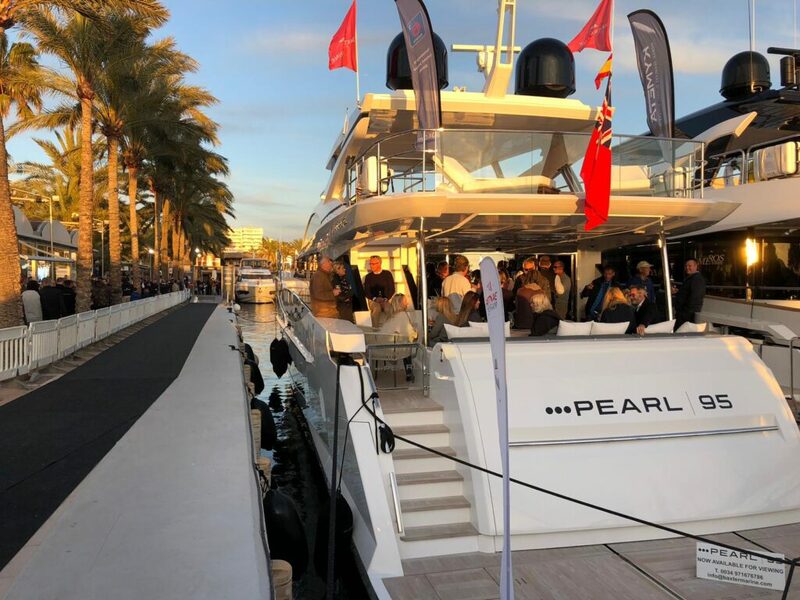 Our team and our guests enjoyed to be on the board of the legendary Pearl 95 while they were watching the first moments of this amazing event in Puerto Portals. The event consolidated as one of the tests of historic cars of the highest international level, both for the number of participants and the quality of them, as well as for having some of the best stretches of the world, as the famous climb of Sa Calobra through a winding slope of 12 kilometers and a curve of 360 degrees. The Rally Clásico Isla Mallorca, is an event that for the last 14 years has been taking place the 2nd weekend of March on this privileged island in the middle of the Mediterranean Sea. This rally is able to combine competitiveness with pleasure and is a reference for other rallies on several aspects. Welcome to a yachting experience as unique and prized as the rarest of pearls. Hand-built by our expert craftspeople to a standard beyond anything you could expect, every Pearl Yachts offers an escape that’s both exhilarating and unparalleled. Consider us the ultimate reward for a life well lived. Porto Portals-based Baxter Marine has been appointed as one of Mallorca´s primary resellers for NautiBuoy Marine – the world´s leader in innovative, multifunctional inflatable floating platforms. Fresh from the success of winning their category in the DAME Awards for innovative products in the marine industry, the NautiBuoy Marine platforms are available in 4 different sizes, in both Hypalon and PVC and are incredibly stable, simple to assemble, manoeuvre and stow as well as being easy to lift from the water. They allow users to create multiple configurations due to the unique modular Air toggle connection system and can be used as jet-ski docks, maintenance platforms, floating islands and pontoons. The company’s portfolio features 20 platforms in a range of options. The Ocean series incorporates 4 designs, CR/CR drop stitch with Hypalon platforms, ranging in length and width. The Voyager series, although identical in the design options to the Ocean series, are fabricated from PVC. The Sport series are stripped back platforms in PVC, without the full connection facilities, for yachts only needing one stand-alone platform for recreational and maintenance use. The Platforms are available in 4 different sizes as well as 2 different surfaces, including a PE Teak effect foam. NautiBuoy has a range of leisure and maintenance accessories, designed and chosen to enhance the users´ water sports and leisure experience and the platform´s versatile capabilities. The platforms provide an extra large space for safe relaxation as well as comfort and leisure away from the confines of the yacht allowing guests to relax even closer to the water. They can also be quickly converted to make a working maintenance platform for topside management – greatly reducing the need for launching the RIB – or used to keep watersports toys away from the vessel in a variety of configurations. The platforms, which feature a patented modular air-toggle connection system, are also ideal to be used as docks for jet skis, SeaBobs and other valuable toys, preventing them from damaging themselves or the vessel – proving an immediate and realizable return on investment in the system. Nautibuoy , with the help of Baxter Marine, is on its way to providing every boat over 10-metres with this must-have, easily managed and stowed accessory that no boat should be without. Safety is paramount and all of the platforms have completed the necessary tests required to be EN compliant, with comprehensive instruction manuals for use and all safety symbols in clear line of vision. Nautibuoy Marine has recently won The DAME award in the highly competitive deck equipment, sails and rigging category for its innovative marine platforms, which launched in April 2015. Designed by yachtsmen, the Nautibuoy Marine platform was born out of the frustration felt whilst working as crew on medium to large motor and sailing yachts. Extends the yacht space for a fraction of the price, adding much needed swim platform area to yachts. Modular Options offered so they can be linked in multiple configurations, giving the freedom to choose the design and space required. So stable that they offer a superb place to do Yoga and exercise. Creates a walkway between yachts when they are moored close to each other. Multifunctional, converts easily with use of a cover, from Leisure to Maintenance use offering a tender free solution to topside maintenance. Super-stable and quick & easy to remove from the water with unique Ballast System. 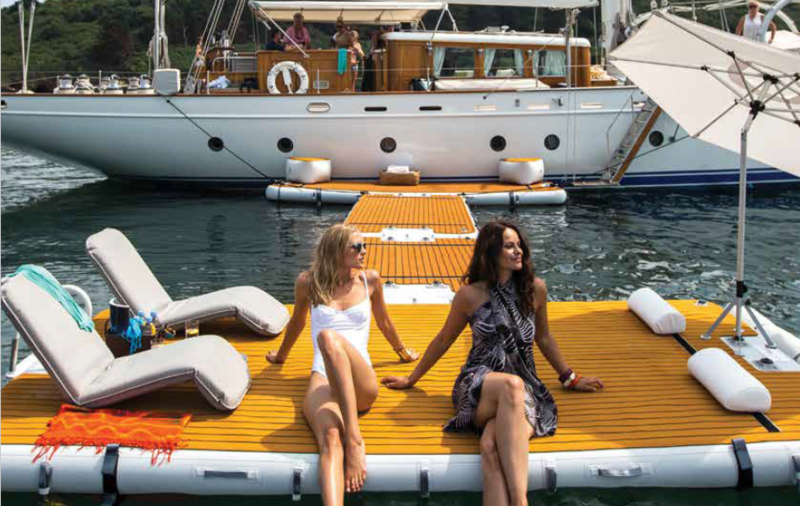 Baxter Marine has invested in 3 platforms of varying sizes, in both the diamond and teak finish with all the accessories that either come with the product or can be purchased as additional options. These are currently on display at their main office in Porto Portals and additionally in their joint office with Palma Sea School at the Nautical Centre, Paseo Maritimo 38 – just across from the bottom gate of Club de Mar in Palma. Alternatively, appointments for product demonstrations can be booked with staff at Baxter Marine who will be happy to visit clients at their location. 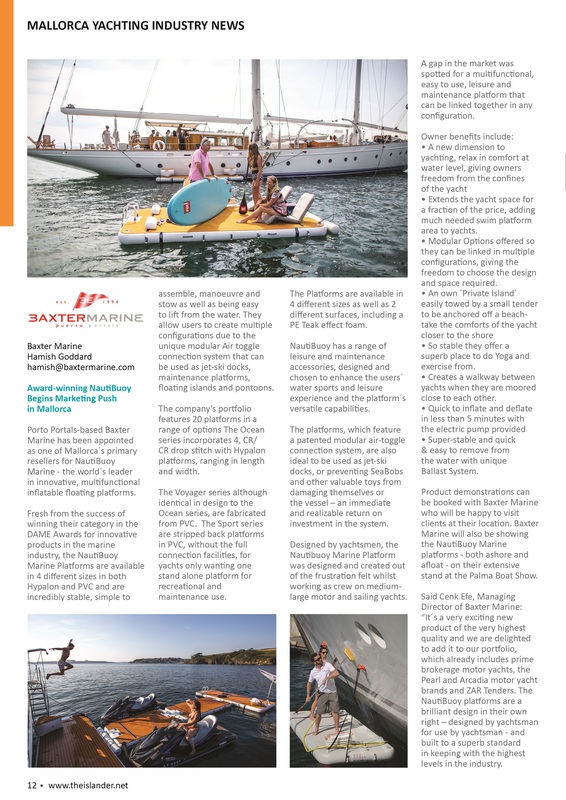 Baxter Marine will also be showing the NautiBuoy Marine platforms – both ashore and afloat – on their extensive stand at the Palma Boat Show. Said Cenk Efe, Managing Director of Baxter Marine: “It´s a very exciting new product of the very highest quality and we are delighted to add it to our portfolio, which already includes prime brokerage motor and sailing yachts, the Pearl and Arcadia motor yacht brands and ZAR Tenders. The NautiBuoy platforms are a brilliant design in their own right – designed by yachtsman for use by yachtsman – and built to a superb standard in keeping with the highest levels of the yachting industry.